Montaña de Oro State Park has dramatic ocean bluffs and summits with sweeping views. The park covers over 8,000 acres and has 7 miles of undeveloped coastline, making it a rare treasure on the California Coast. One road leads into the park, entering from the town of Los Osos to the north, which is just west of the city of San Luis Obispo. Visitors can stay overnight at a 50-site campground at the center of the park. First time visitor should be sure to hike the Bluff Trail, which crosses sea cliffs and coves on the impressive oceanfront. With more energy, you can hike to a mountaintop like Valencia Peak, Oats Peak, or Hazard Peak. Every summit trail offers great ocean views. Each peak also looks inland across the Irish Hills, which spread beyond the eastern boundary of Montaña de Oro State Park. Hazard Peak in particular provides nice views north up the coast toward Morro Bay and beyond. Generally speaking, mountain bikers are allowed on trails on the north side of the park, but that seems to be expanding as Oats Peak is now open to bikes as well. Islay Creek Trail and Hazard Peak Trail and also popular mountain bike routes and the Bluff Trail presents an easier ride. Dogs are not allowed on trails in Montaña de Oro State Park. The list below contains 10 hikes in Montaña de Oro State Park as well as two additional hikes on the edge of the park (one hike in Morro Dunes Ecological Reserve rises to a viewpoint within Montaña de Oro State Park and another trail travels down the remote coast to the south toward Point Buchon Trail and relies on a trailhead within Montaña de Oro State Park). 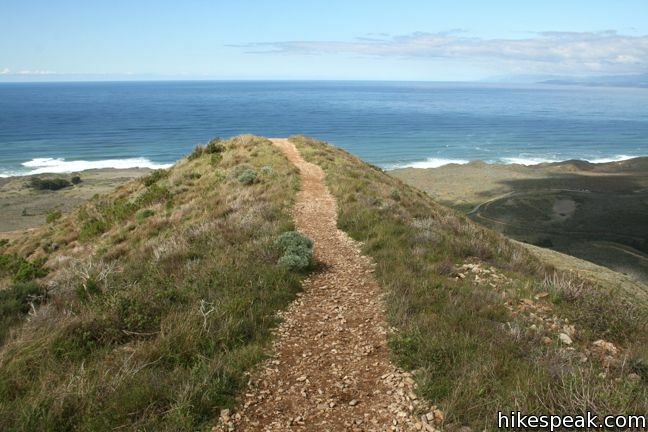 These Montaña de Oro State Park hiking trails are listed from north to south and include an average star rating of each trail as decided by the readers of hikespeak. After you complete one of these hikes, come back, give it your own star rating, and pick another hike! This 2.6-mile loop serves up panoramic views over Morro Bay as it ascends 800 feet from Los Osos to Montaña de Oro State Park. This one-mile hike goes down an oceanfront ravine to a rocky shoreline with engaging tide pools. This 2 2/3-mile loop combines four trails through dunes and eucalyptus trees to lovely coastal views. This 6-mile out and back hike ascends coastal ridges to a 1,076-foot summit with panoramic views that include a dynamic perspective of Morro Bay. This 9.2 mile loop continues beyond Hazard Peak deeper into Montaña de Oro State Park before circling back on Islay Creek Trail. This 5.55-mile hike rises through a eucalyptus grove and views of Morro Bay to a panoramic summit in Montaña de Oro State Park. This easy 6-mile out and back hike follows a wide trail up a coastal canyon flanked by thousand-foot peaks, passing a small waterfall to reach an abandoned barn. This 2-mile loop delivers fine ocean and canyon views as it explores the bottom of Islay Creek Canyon. This 10.8-mile hike ventures into the park to a lofty, panoramic summit. This 4.5-mile hike summits a 1,347-foot peak with stunning views over Montaña de Oro State Park. This hike of around three miles tours tide pools, beaches, and impressive cliffs along the picturesque coast of Montaña de Oro State Park. This 1 2/3-mile hike offers a twist on the Bluff Trail, going along and just above the coast of Montaña de Oro State Park. This 5-mile out and back hike ventures up a coastal canyon at the south end of the park. 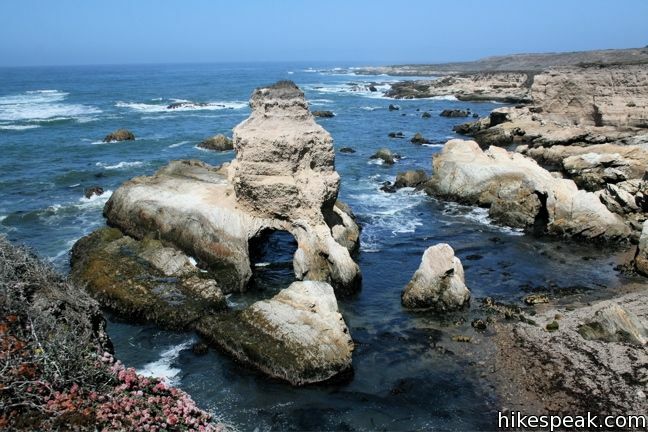 This 1 1/3 to 6.8-mile hike explores the beautiful coastline south of Montaña de Oro State Park. When are the poppies/wild flowers blooming? No, dogs are not allowed on park trails. Is there backpacking with water available here?